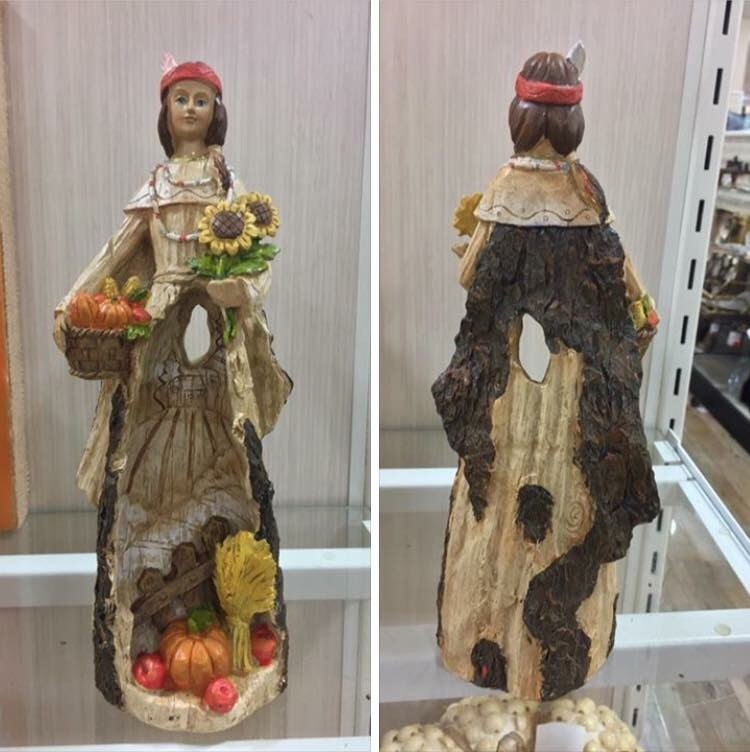 HomeGoods’ Thanksgiving figurine looks okay…until you really see it. Take a look: Here is a native woman whose body has literally been hollowed out to make way for a an etched depiction of a European settlement. There is also a hole large enough to poke with a digit in roughly the spot where her reproductive organs should be. If this had been created by a Native American artist as a critique of the colonization of the Americas, it would be breathtaking, a scathing commentary on a dark part of our shared history. But presented as a celebratory bit of Thanksgiving decor, it is tone-deaf to these issues and quite troubling to anyone who is skilled in unpacking representations of women. This representation is only “positive” when seen from an unapologetic colonialist perspective. From an indigenous perspective, it is abhorrent. So, I would like to make a request of HomeGoods buyers: Please have more cultural sensitivity than this when selecting your fall / Thanksgiving decor offerings. The way this woman’s body is depicted is incredibly problematic, especially given the history of European settlers’ abuse of the native population. Just some unpleasant but important food for thought from my errand-running today.